Is there a time frame for love? Can people be in love in just a short amount of time or is more time necessary to determine whether or not two people are truly in love? How do we know? Am I a skeptic because I am unsure whether true love really exists? I mean, if you have been reading any of my stuff you know that I question pretty much everything in the entire world. Why would I stop at questioning the validity of true love??? I guess I just sometimes wonder if people are truly “meant” to be together. Don’t get me wrong, I admire strong, loving couples but I sometimes wonder if they enjoy each other so greatly that they decide to build a life together….but are they truly “meant” to be together. I feel that those people that are “meant” to be together…those so-called “soul-mates” are very few and far between. I think distance and life circumstances keeps people apart which inevitably draws us into those that surround us in this very moment. I don’t find any harm in this…I am just always curious of answers….of the ultimate answers in life….the meanings and the purposes. I posed this question because it seems as of lately I have encountered people that have become wrapped up in brand new relationships and within a very short amount of time the words I Love You are being beckoned out of the mouths of both parties. After only one month of knowing someone, is it possible to love someone? I mean, as far as I know, love does not come with a set of rules or guidelines….but I admit that I have some skepticism when believing that people knowing each other for such a short period of time can TRULY love each other. I am proven wrong all of the time though. I say this because there have been people in my life for several years that I am still learning about and with some, I have found that over time I loss any fondness toward them because our lives did not feel in sync. I have also felt the opposite….I have grown to admire and love others because they have opened up and shown me how beautiful they are. 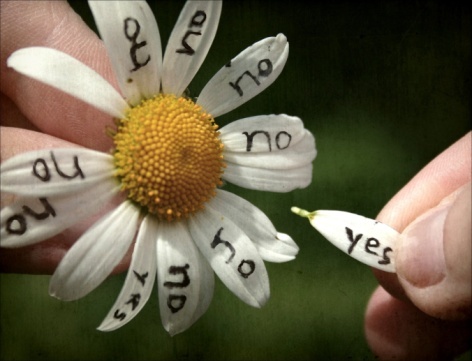 Love is a guessing game….time is the only answer. I believe this is why our divorce rate is so high…people think they know someone but time shows them a completely different person…and they do not like this person enough to continue this legal union. I am not knocking love in any which way. I am a HUGE believer in love in all forms. I believe in love because I personally define it….love cannot be defined for the whole. There are just certain expressions and ideas that I question (I said question….I did not say they were wrong). I wonder what the guidelines for being “meant to be together” entail. Who decides this? I guess I sit here and wonder how people have such strong convictions when there is so much I don’t know…there is no proof that these things are actually true. I have always wondered how some people have whole-heartedly believed in things without question while I sit here asking why why why???? I admire people with these convictions but I am unable to understand them because I am unable to relate. There has been nothing that I have been able to believe in fully without have evidence or proof put in front of me. The majority of us drive ourselves absolutely crazy just waiting for Mr. or Mrs. Right to walk into our lives. We may not like to admit it but it seems to be the end all be all….the thing that drives us to get through everyday….it feels almost like the purpose of life. I admit to being one of these dreamers…not every day but too many days that I would like to admit to. With the idea of love comes the idea of comfort. There is comfort in knowing that someone is waiting for you at the end of the day….wanting to talk to you and spend time with you….comfort in knowing you are not alone. Whether soulmates or people that are “meant to be together” is a reality….it really doesn’t matter. Love is what you want it to be. For me, I really don’t want to put guidelines on something that should be absolutely natural. Honestly, this is why I am so unsure of marriage. I don’t believe that love should involve a whole bunch of people and a whole bunch of signed documents….these things do not prove love (this is not being said to insult anyone that chooses marriage—the freedom of choice is the beauty in life). Love is truly simple. At least that is what I think. There is a lot I do not know or understand or 100% believe when it comes to love so therefore I choose what I want to believe…as I do with most things. This way of thinking has its strengths and weaknesses in life but it is my way of doing things….my way of being myself to the fullest. For me, my true soulmate was identified upon initial introduction by a mutual friend, in less time than it took to take a deep breath! Now, as we go on together, after 13 years, we find the dimensions and tentacles of our love creeping into more and more previously-hidden nooks and crannies of our lives! Hi there, I’ve nominated you for the Versatile Blogger award. For more details view this post http://paulsmusing2.wordpress.com/2012/08/15/versatile-blogger-award/ and post the image award on your blog. I have to agree with you that people do seem to use the word love very loosely nowadays. Nobody seems to know what infatuation is either! I am still in love with my wife after nearly 3 decades.. I come from a totally different perspective. I wholeheartedly believe in forever love, love that starts out romantic, warm fuzzy (in our case “at first sight” ) which evolves over time into a decision to continue in the commitment we made to each other May 29, 1976 in front of a church full of people, many of whom we didn’t want there, but my MIL sure did, so she invited them. That love has endured many trials and triumphs, we’ve truly seen in sickness and in health, for richer for poorer (though never really poor). I hope you someday can experience this wonder. True Love cannot be found if conditions are put on it !!! Still not married after nearly 20yrs of joy & tears with one guy, and have no real intention too..although it would bring our taxes down! !